Modern day hard drives are continuing to leap forwards in terms of their storage capacity and, as a result, the prospect of dividing a large drive in to several partitions becomes increasingly tempting. Partitioning a drive up in to several smaller segments allows you to easily create completely separate drive letters that can be used for specific purposes.For example, rather than just having your ‘C:’ drive which is used to hold your Windows installation and program files you could also create alterative drive letters such as a ‘D:’ drive to store all your documents and an ‘E:’ drive that is used solely for media such as pictures, music and video files. In particular, one thing that frustrates me is that whenever you purchase a new computer, the system manufacturers often decide that you should use sizable chunk of the drive to hold your Windows backup files in case you need to do a repair installation.In some instances, I’ve seen this ‘backup’ drive practically empty but irrespective it has been allocated a large amount of the overall size of the drive resulting in a severe amount of wastage.Many users, especially those with backup discs would benefit from reclaiming this space for their own use. Suffice to say, whichever way your hard drive is segmented at the moment probably isn’t how you would like to have it in an ideal world.Unfortunately deleting partitions, creating new ones and altering the space allocated to existing partitions using the tools build in to Windows isn’t particularly easy, if not impossible and as such we have to rely on a specialist piece of software. 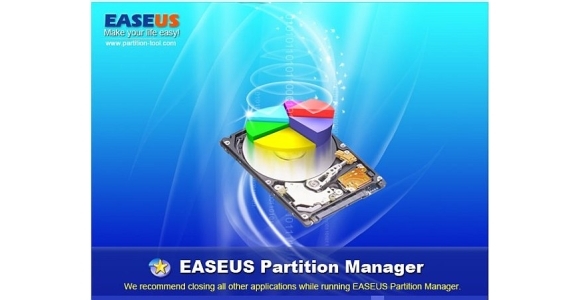 EASUS Partition Master (www.partition-tool.com) is a completely free application that has a tiny 8.9mb footprint that allows you to achieve all the above without having to worry about potentially formatting the drive to create the partition or reformatting whenever you wish to change a partition size.The interface is easy to use and well organised so even those that have never played around with the structure of their drive will feel confident enough to give it a go.This having been said there is of course documentation to guide you through the process if needed. Partition Maser supports up to thirty two simultaneous hard drives, each between 2GB and 1.5TB in size so despite being the free ‘Home Edition’ version it is unlikely to cause problems on even the highest specification machines.The only absence is the lack of support for 64-bit versions of Windows and unfortunately these users will have to purchase the professional edition at a cost of just over £20. Along with the basic operations such as create, resize/move, delete, change label and format there are the more advanced wizards ‘Copy Disk’ and ‘Copy Partition’.These allow you to copy an entire disk or partition to another drive – this is perfect if you have two drives in your system and want to quickly and easily back up one to another. I will stress that if using the application on a one disk machine then dividing the one drive in to two sections with the intention of backing up from your ‘C:’ drive to your ‘D:’ drive isn’t a sufficient backup strategy; if the hard drive goes down you would lose both partitions.Always backup from one physical drive to another and ideally store the backup in a separate location. If you want a little more control over how your hard disk is divided rather than just taking what was given to you when you first purchased your machine then Partition Master represents a fantastic free tool.